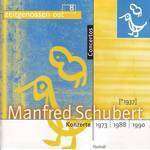 Der Artikel Manfred Schubert (1937-2011): Konzert für 2 Violinen & Orchester wurde in den Warenkorb gelegt. Records International 1998: "The Double Concerto playfully refracts classical models - especially that of Bach - through a teasing hall of mirrors of 20th-century techniques, producing a result that is full of individuality and appeal while playing with the listener's preconceptions and thereby heightening the point of composer's argument. There is a serenity of expression throughout these works, especially in the voluptuous Canzoni Amorose, which is unusual in music of our time which does not seek to avoid a modern vocabulary." Berliner Zeitung: "Seine Werke verströmen ein mediterranes Flair."